During the beginning of World War I, aerial photographers used handheld cameras to capture photographs of specific targets in order to provide images that coincided with their reports. Once the photographs were developed, annotations marked the location of the enemy, weapon positions, trench construction, and other points of interest. Military leadership took this information and used it to prepare for attacks against the enemy’s position or to plan best routes for large troop movements. As automatic cameras became more widely used, the use of vertical aerial photography increased. This caused photo interpretation to require a more formalized approach, weakening the connection between the photographer and the image. Over the years, photograph interpretation began to require more analytical skills as the demands for intelligence grew. Service members worked tirelessly to develop new ways to deliver intelligence to military officials. Officers planning attacks or preparing for large-scale troop movements wanted the nearest thing possible to an actual airplane ride over the terrain. To accomplish this, interpreters were taught which chemicals could be used to remove unwanted markings on an image; how to better prepare reports with overlapping images; how to utilize stereoscopic images; and perhaps most importantly, how to create mosaics, or large photo assemblages, to provide the most detailed views of the front. 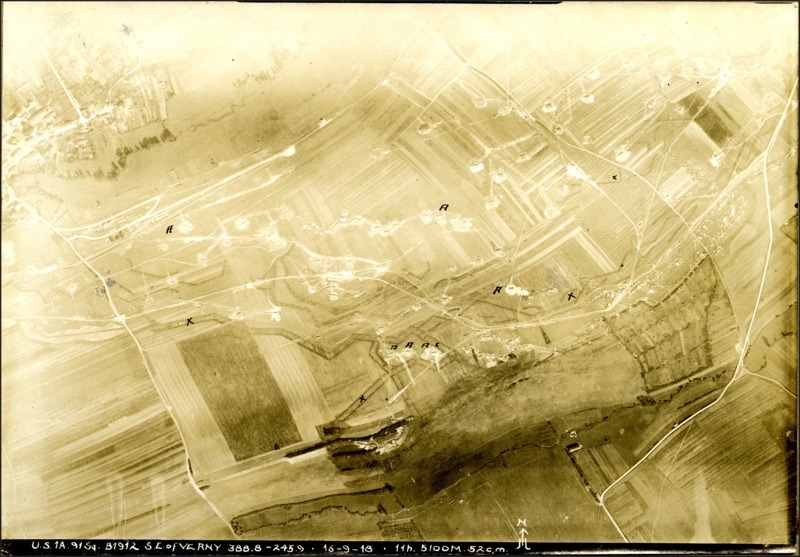 This photograph was taken southeast of Verny, France on September 16, 1918 and demonstrates the ways photographs were interpreted for military intelligence. The “A’s” mark the location of enemy artillery units while the “X’s” may represent enemy troop location. This photograph also shows the extensive trench work that ran along the European countryside. Photographs like this one would have been used to plan troop movements or attacks on the enemy’s position.